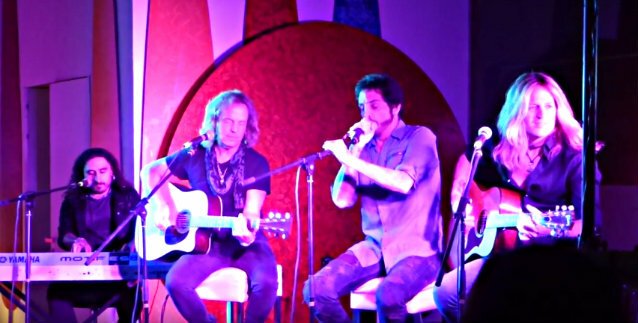 REVOLUTION SAINTS, the band featuring Deen Castronovo (JOURNEY, BAD ENGLISH), Doug Aldrich (THE DEAD DAISIES, WHITESNAKE, DIO), and Jack Blades (NIGHT RANGER, DAMN YANKEES), made its live debut on Friday, April 28 at the VIP acoustic party of the Frontiers Rock Festival in Milan, Italy. Fan-filmed video footage of the performance can be seen below. REVOLUTION SAINTS recently entered the studio in Italy to start recording its second album with producer Alessandro Del Vecchio, who also helmed the band's debut album. Castronovo, Aldrich and Blades will record a scorching set of songs written by Doug and Alessandro between the end of 2016 and early 2017. The band hopes to do more shows to promote the forthcoming album, which is currently set for a release in early October. REVOLUTION SAINTS was initially the vision of Frontiers president Serafino Perugino, who for years had hoped to work on a project where Deen would be the lead vocalist. Having previously worked with all three artists on different projects on Frontiers, getting Deen, Jack and Doug together was a dream come true for the president of the label. With production overseen by in-house Frontiers man Del Vecchio, the recording process for REVOLUTION SAINTS' debut happened in Portland, Oregon during the summer of 2014. Aldrich told CrypticRock.com about REVOLUTION SAINTS: "We definitely have a chemistry together. When we got together to do some videos as well as recording together up in Portland, it was undeniable that we had a chemistry, and it sounds like that on the record. Spending time with those guys is super fun and we all fell into our own zone. For example, Deen is a frontman and the drummer with Jack, but he is like the young kid that has way too much energy, bouncing off the walls. I am kind of the quiet guy; I really do not have much to say. I just want to play. Jack is kind of the general; he took over, and in a good way, because you need somebody to be the boss. You need somebody to organize stuff or else you are wasting time or going down long paths. Jack keeps you focused. Then we all have our creative side, but the energy that Deen has is just infectious. I hope to be able to put it together where we will be able to do some shows."